Falcon 9 v1.1 lifts-off from Cape Canaveral for its first GTO mission (Credits: SpaceX). 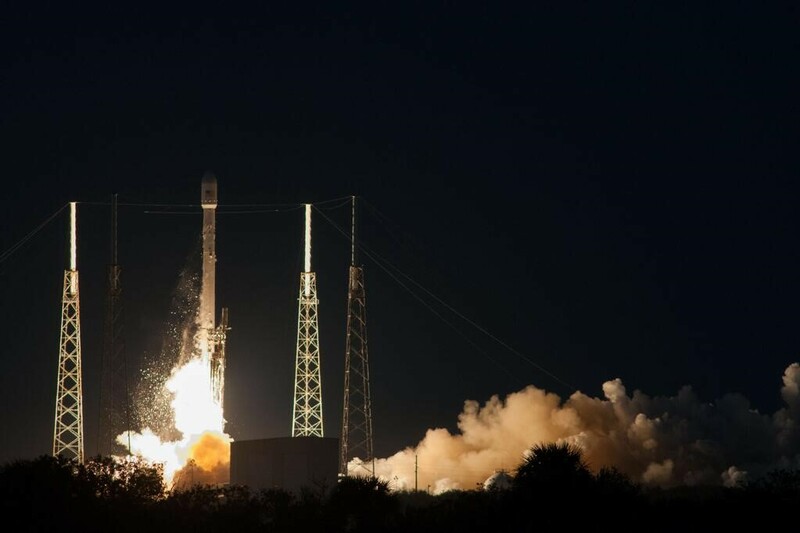 SpaceX’s upgraded Falcon 9 (v1.1) successfully lofted the SES-8 telecommunications satellite into geosynchronous transfer orbit, on December 3, 2013. Even before the launch campaign, Martin Halliwell, the chief technology officer for SES, had stated: “Let me put this very clearly and maybe not too dramatically: The entry of SpaceX into the commercial market is a game-changer. It’s going to really shake the industry to its roots.” Although five aborted attempts within two campaigns in the last eight days forced both SpaceX and its customer SES to postpose their celebration for a while, with today’s successful launch they could finally heave a sigh of relief. Founded in 2002, Space Exploration Technologies Corporation (SpaceX) has developed three launch vehicles to date. The smallest of the family, the single-engined Falcon 1, made five launches between 2006 and 2009. Although the first attempts had failed, the last two launches of the vehicle were successful. In 2009, the company decided to discontinue this launcher to focus on its mid-sized vehicle, the Falcon 9. Falcon 9, which uses a 9 engine bundle configuration as a first stage, had a more solid success story than its predecessor. Six low Earth orbit (LEO) missions to date have been carried out by the vehicle, two of which specifically carried cargo to the International Space Station, all of them successful. For the first five of these missions, SpaceX used the v1.0 configuration of Falcon 9; while the very last mission on September 29, 2013, was conducted with an upgraded version of the system. This upgraded version, namely Falcon v1.1, uses more powerful Merlin 1D engines then the 1C’s on v1.0, and is able to produce the required thrust for beyond-LEO missions. The last member of the Falcon family, Falcon Heavy, is still in its development phase and is expected to be operational in 2014. Today’s mission was of high importance, since it was the first geostationary launch mission for Falcon 9, as well as for SpaceX itself. The two-stage rocket lifted off from its pad at 23:41 GMT, with the first stage separated from the upper stage after a three-minute burn. The second stage had its burn around five minutes, which was followed by a longer coast phase. Once the coast ended, the engine restarted for another one-minute burn, which supplied the required thrust to inject the spacecraft into a supersynchronous transfer orbit with an apogee at 80,000 km altitude. The separation between the second stage and the spacecraft was performed successfully around T+33 minutes. Being injected into such an orbit, the satellite was able to use less of its onboard propellant to transfer itself into its final orbit, GEO, at approximately 36,000 km. Preparation of the SES-8 satellite (Credits: SpaceX). Today’s mission was originally planned for Monday, November 25, however several problems with the valves and voltage-overload interrupted the countdown. A second campaign took place on November 28, 2013, but although the countdown reached to t-1 seconds and the first stage engines were ignited, the control computer did not allow the vehicle to leave the pad due to a “slower than expected” ramp-up of the thrust. The vehicle was kept in its vertical configuration after the abort, allowing engineering teams to make a detailed on-site inspection of the situation. “Abort was caused by oxygen in ground side TEA-TEB,” tweeted Elon Musk, the CEO and Chief Designer of the company, after the inspections. Falcon 9’s Merlin 1D engines use TEA-TEB mixture and oxygen as the hypergolic propellant pair, which ignite on contact. A minor leak of oxygen into this mixture, however, will not cause an immediate reaction, but rather contaminate the fuel and end up with a slow thrust build-up during the ignition. Once the problem was understood, as a precautionary measure, SpaceX teams cleaned the turbopump gas generators of all 9 engines in the first stage, and also changed the gas generator on the center engine to maximize the probability of a problem-free launch for the third campaign. Today’s launch was also critical, since it was the first ever demonstration of the restart-capability of the vehicle’s second stage engine, which is optimized for near-vacuum conditions. During the mission on September 29, SpaceX had planned a demonstration of this capability, however, although the vehicle successfully delivered the Canadian CASSIOPE and a few secondary payloads into their proper orbits, the reignition did not occur. Following an investigation, SpaceX officials had stated that “The igniter fluid lines froze after longer exposure to cold oxygen. This never happened on the ground because ambient air kept the lines warm. We’ve added insulation and made sure that cold oxygen can’t impinge on the lines.” The successful reignition of the upper stage Merlin 1D engine during today’s launch shows that the crux of the problem was correctly addressed and solved by the engineering teams of SpaceX. While it is an operational commercial launch vehicle, Falcon 9 v1.1 is also a testbed for SpaceX on its path to produce a reusable version, the Falcon 9 Reusable (F9R). For this reason, the first stage engines are fueled so as not to consume all the propellant before separation, but rather leave some to orient and slow the stage down after its reentry to Earth’s atmosphere. This maneuver was demonstrated during the September 29 mission, where the stage survived the harsh reentry environment and put itself into a position for the final landing maneuver. Just before splashing down the stage lost attitude control, as a result of which it hit the ocean fairly hard and broke into pieces. However, no demonstration of this concept was planned for today’s launch, since it was more critical to burn the first stage fuel to depletion in order to maximize the vehicle’s performance on its way to GTO. With today’s launch, as SpaceX makes its first successful step into the GEO launch market; its customer, Luxembourg-based company SES, celebrated its 55th satellite in orbit. The 3.1 ton communication satellite, SES-8, with hybrid Ku- and Ka-band transponders onboard, will provide coverage of the South Asia and Asia Pacific regions. 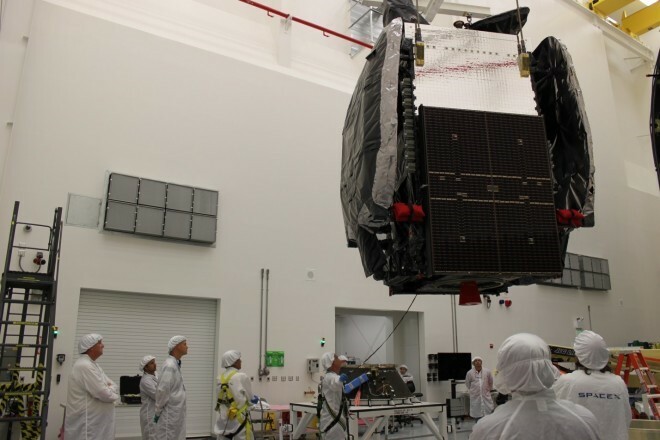 SpaceX, which has a production rate of 12 Falcon 9 rockets per year at the moment, is planning for the next geostationary launch of the vehicle within a few weeks’ time, carrying the Thaicom 6 communication satellite to GEO this time.